What is Love? One of the most commonly used words in the English language - but possibly the most misunderstood. 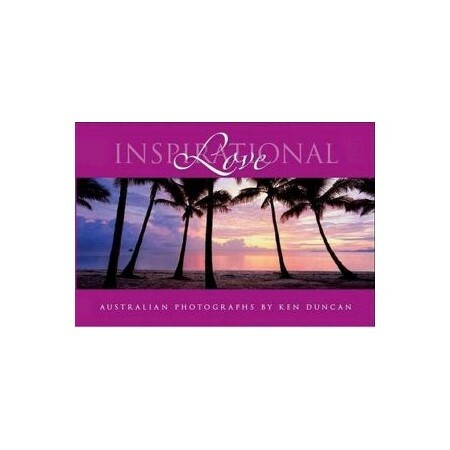 Australia's foremost landscape photographer Ken Duncan compliments his stunning Australian landscape images with emotive and inspirational quotes on true love by some of the world's most famous people. He shares with you the most profound description of true love and hopes you are enriched in your understanding of what love is. Inspirational Love is one of a delightful series of Ken Duncan Mini Books designed to delight the reader's eyes and inspire their heart. Ken Duncan OAM, is recognised as one of the world's leading landscape photographers. With every new release of Limited Edition Prints he delights long-time collectors and new fans alike with his own inimitable style of landscape photography. Ken has worked on several international book projects in such exotic locations as Malaysia, China and Hollywood and for years was the preferred photographer for Australian rock band Midnight Oil. His first solo book was published in 1987, and he later went on to become a publisher in his own right. Since 1992, over 30 individual titles have been released under the Ken Duncan Panographs trademark. Although Ken prefers the panoramic format - "that's the way we see", he says - he is well versed in a multitude of formats and media. He has even dabbled in cinematography and would like to do more with this medium in the future. He can turn his hand to any type of photography - from portraits to landscapes to 3-D and everything in between - and produce consistently creative results.